The Sabertooth double-hull can roam free for up to 40 miles, is depth-rated to 3,000 meters and has 360-degree orientation. Saab Seaeye test site for Clean Sea project. Survey pattern for environmental monitoring. 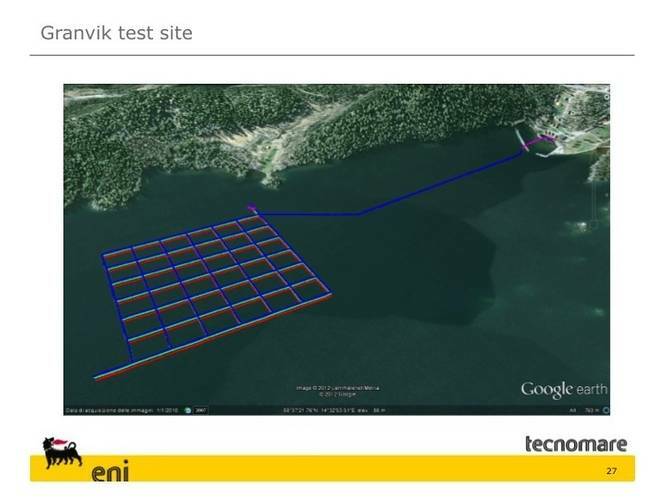 Benefits to asset integrity and environmental monitoring of oil and gas installations will come from a project developed by EniNorge and Tecnomare called Clean Sea (continuous long-term environmental and asset integrity monitoring at sea). The Clean Sea team has found answers to key issues, like the early warning of spills and leakages, with imaginative technological solutions using a Sabertooth hybrid AUV/ROV from Saab Seaeye. They sought to overcome the current shortcomings of environmental monitoring and inspection of oil and gas infrastructures. Usually such work is restricted to an annual undertaking and typically involves supply vessels and various underwater systems. They recognized that the industry is moving into more challenging development areas - possibly in remote, hostile or environmentally sensitive places - where conventional methods may be unsafe or unsustainable. 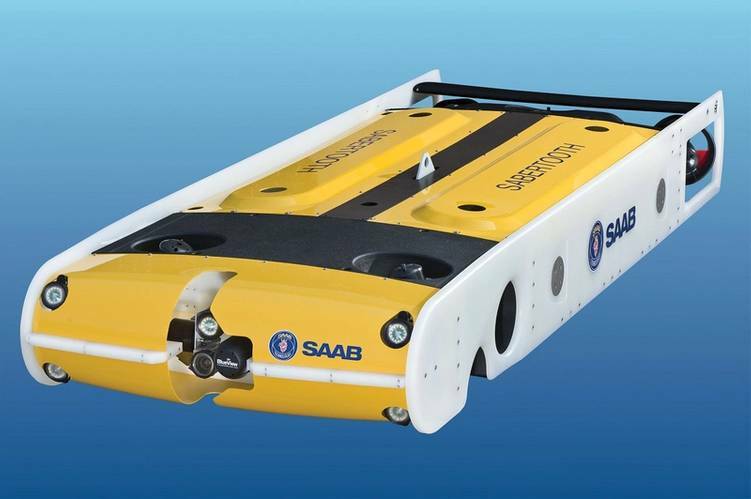 Finding that no specific underwater vehicle existed for the tasks of asset integrity and environmental monitoring, the Clean Sea team identified the Saab Seaeye Sabertooth as the most suitable platform for the development of this concept. 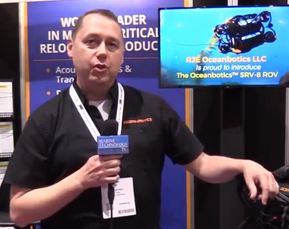 Sabertooth is a unique vehicle that blends proven defense and commercial technologies into a single resource that combines the autonomous roving characteristics of an AUV with the work performance of an ROV. The resulting autonomous vehicle can accept interchangeable modules and has the 360-degree maneuverability and hovering characteristics necessary to operate in the proximity of structures whilst undertaking inspection and monitoring tasks. Fitting the concept of interchangeable modules that the Clean Sea team called, E-PODs, is made possible through the open interface architecture of the Sabertooth. Each E-POD module is dedicated to a particular task that can include automatic water sampling, hydrocarbon leakage detection, chemical analysis, visual inspection and acoustic surveying. The advantage of a modular concept is that a selection of E-PODs can be readied for environmental monitoring during all phases of field development. Typically this would include baseline monitoring before activity takes place; environmental impact monitoring during exploration and production; post-incident monitoring to record effects and environmental recovery; general spill and hydrocarbon leakage detection; along with visual inspection of structures, manifolds and associated equipment. In developing their concept, the Clean Sea team has taken full advantage of the Sabertooth’s sophisticated technology architecture. Detect a leak and find it. For example, the vehicle’s system of reactive control will modify a preprogrammed mission in real-time so that when a leak is detected it can autonomously locate the leak by subsequent analysis of gas measurements and move towards the leak source and film it. Standard environmental sensors can be fitted to include temperature, conductivity, dissolved oxygen, fluorescence for chlorophyll and organic matter, turbidity, dissolved methane, PAH, pH and ORP. In the future, the Clean Sea team see the potential for locating E-Pods on the seabed alongside the Sabertooth at its remote underwater docking station, where it will remain resident for a year ready to be deployed as needed. This will give year-round access to locations normally inaccessible due to ice or exceptionally harsh weather, and offer safer monitoring in geographical regions prone to insecurity. The hovering characteristic of the Sabertooth makes it possible to operate from docking stations, where data can be exchanged, either on wireless flyby, or direct docking, and where batteries can also be re-charged and interchangeable instrument modules attached remotely for various missions. 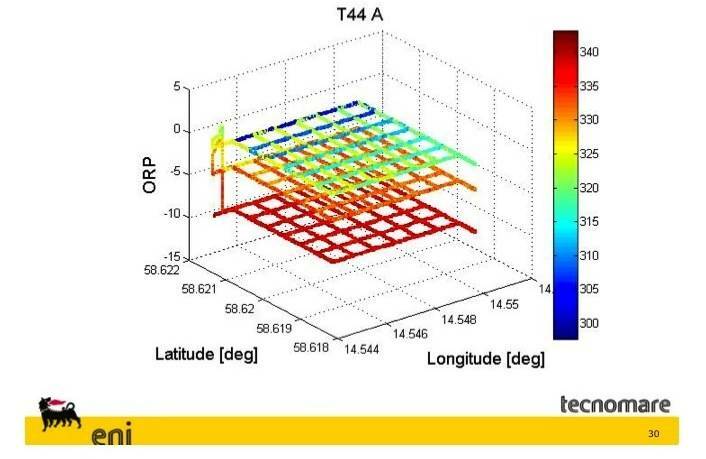 Having successfully demonstrated the potential of Clean Sea technology during field tests on environmental monitoring, the team plan a second phase of field tests to demonstrate the more complex functionalities of asset integrity tasks.